Leatt STX RR Road Neck Brace: "Protect ya Neck!" 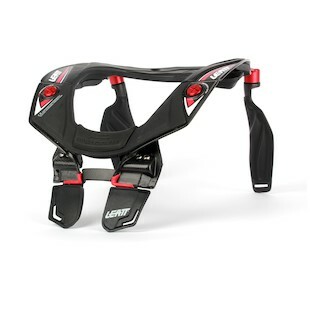 The Leatt STX RR Road Neck Brace, despite what the name suggests, is a track and road race specific product. I see you wearing your Arai Corsair V on the street. “But if it’s a race-level product, it must offer more protection, right? Wrong!” This RR version is a purpose built piece of fiberglass reinforced polyamide resin goodness, meant to be worn ONLY while racing and ONLY with a race suit. Your neck is a complex piece of anatomy, treat it as such. A lot of engineering has gone into neck brace technology, so sit down and feed your brain. 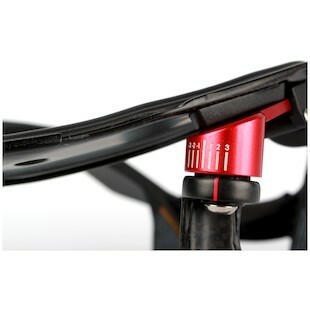 The Leatt STX RR uses ALPT (Alternative Load Path Technology). This is how all neck braces work. Unlike helmets and knee braces, neck braces are not meant to absorb all the shock of an impact, but rather disperse it over the rest of your body - which can collectively absorb much more energy than your spine. The most common of neck injury happens when you flip over the handlebars and smack the back of your head on the pavement. The neck bends forward until . . . SNAP. No bueno! The RR neck braces acts like any other Leatt does and stops your neck from moving too far forward (hyperflexion - the stuff that paralysis is made of). It does the same for hyper extension (backwards), lateral hyperextension (side to side), hypertranslation (front to back) and compression (from the top). The magic of the RR is that it has a profile low enough, and a design streamlined enough to offer all this protection in a format that is comfortable for the track. It’s designed for the tuck position and nothing else. If you’re riding upright, look elsewhere - this will not be as comfortable or as safe. The STX RR is not currently being worn by any pros, but it is being tested by Aleix Espagaro - so it’s no joke. Leatt’s lab in Capetown, South Africa is one of the most extensive and well stocked in the world (it turns out a lot of R&D goes into protecting your neck). While the brace only comes in one size, there’s a lot of adjustability (neck size and height) - which you will need. The STX RR is designed to fit outside of race leathers and works well with speed humps, so leave your Aerostich suit at home. In the event of a crash, the brace will transfer as much energy as possible to your body, but is designed to break away if necessary. This prevents injury to the collar bone and other places the brace comes into contact with on your body. The brace should sit on your shoulder blades, not your speed hump. You want it as close to your body as possible. Remember, this is a purpose built race product. Much like GP bikes, the STX RR has a very specific function, and if used outside of that - it will not work properly.